As of July 2013, Google will not confirm Panda updates anymore. And as I explained in my post about unconfirmed Panda updates, this can lead to serious confusion for webmasters. For example, if Panda updates are not documented, then it becomes that much harder to understand why a serious drop in organic search traffic occurred. Was it Panda, a smaller algo change, was the drop due to links, or other factors? Even when Panda updates were confirmed, it was still a a confusing topic for business owners. And now it’s even more confusing since those updates are cloaked. According to John Mueller of Google (via a webmaster hangout video), the Panda algorithm is now trusted enough that Google feels comfortable rolling it out once per month. That link should jump you to 22:58 in a video where John speaks about Panda. It’s not real-time like some people think, it’s simply trusted more than it once was (and Google can bypass some of the testing it used to implement prior to rolling out Panda). The new Panda can take ten days to fully roll out, and again, Google will not provide confirmation of the updates. So yes, Panda updates have been occurring since the last confirmed update, but it’s just harder to pinpoint those exact dates. In my post about unconfirmed Panda updates, I explained that SEOs well-versed in Panda can typically shed some light on new updates. That’s because they have access to a lot of data. And not just any data, but Panda data. 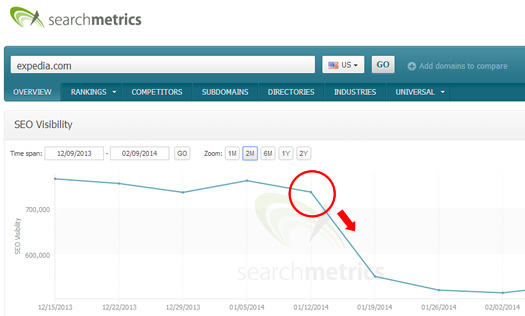 The more companies an SEO is helping with Panda, the more that SEO has visibility into when Panda actually rolls out. In addition, SEOs heavily working with Panda might have more companies reach out to them that were impacted by subsequent Panda updates. That’s even more Panda data to analyze. That’s why I believe SEOs heavily involved with algorithm updates can act like human Panda barometers, and can help determine when new updates roll out. Based on my work with Panda, I’ve had the opportunity to see when some cloaked Panda updates rolled out (like the August and September Panda updates that I documented in my post from November). The reason I can identify some of the newer Panda updates is because some of the companies I’m helping see recovery, while other companies that were just hit by Panda reach out to me for help. The combination of the two enables me to pick up when some Panda updates roll out. So, 2014 kicked off and I was wondering when the first major algorithm update would happen. 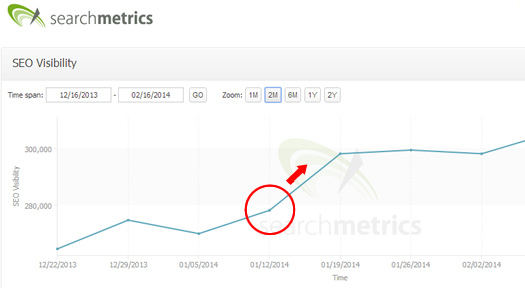 And it didn’t take long… as January 11th was a tough day for many webmasters. Right around the 11th, I noticed an uptick in webmaster chatter about an update occurring, which quickly led me to Google Analytics to trend Google organic search traffic across several websites dealing with Panda problems. Low and behold, there was significant movement. In addition to companies I am currently helping, my inbox also confirmed something was going on. I had several new companies reaching out to me after the 11th explaining that they saw a major hit starting on that date. Upon checking their reporting, you could clearly see a significant drop beginning on January 11, 2014. And digging deeper revealed that a number of those companies had battled with Panda in the past. A few had also exchanged blows with Phantom on May 8, 2013. This led me to believe that we were witnessing our first Panda update of 2014. And since I’m a big believer in naming updates to document them specifically, I’m going to name this one too. 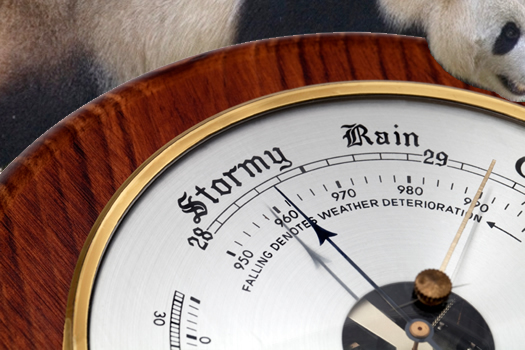 I’m calling it Panda UJan14, for “Unconfirmed January 2014”. I think this naming convention works extremely well, since the new Panda is supposed to roll out monthly. Providing the month and year in the update will help clarify when those updates rolled out. As mentioned earlier, a number of those companies had previous battles with Panda. Clearly, they had content quality issues from a Panda standpoint. When speaking with the business owners about the drop, they all explained implementing changes over the years when dealing with previous Panda updates. But as I explained in a post about the grey area of Panda, if you don’t significantly tackle the content quality situation, you could very well get hit again (or not recover in the first place). It’s extremely important to make significant changes in order to exit the grey area. If you don’t, you could sit in the grey area of Panda forever, never knowing how close you are to recovery. Several of the companies that were hit in January did not do enough to clean up their Panda issues, and were subsequently hit with another Panda update. Now the positive impact from UJan2014. On the flip side of the Panda hits were some positive stories. A few companies I have been helping saw increases ranging from 15-25% based on the January 11, 2014 update. These were companies that experienced previous Panda and/or Phantom hits, have been working on fixing their content problems, and saw an increase in Google organic traffic during the UCJan14 update. It’s important to note that several of the companies did not recover fully to pre-Panda or pre-Phantom levels, but they definitely saw a nice increase. Remember, there’s a reason the sites got hit by Panda in the first place. The content that was once ranking well and driving traffic shouldn’t have been ranking that well in the first place… which led to a lot of traffic with serious engagement issues. And serious engagement issues (like extremely low dwell time), can cause a Panda attack. More context about that situation in my Search Engine Watch column about the sinister surge before Panda strikes. In addition to websites recovering from Panda, I noticed a number of companies simply benefiting from the hits others were taking. For example, if certain companies drop out of the rankings, then others take their place. Those companies were simply benefiting from the drop in rankings of January Panda victims. 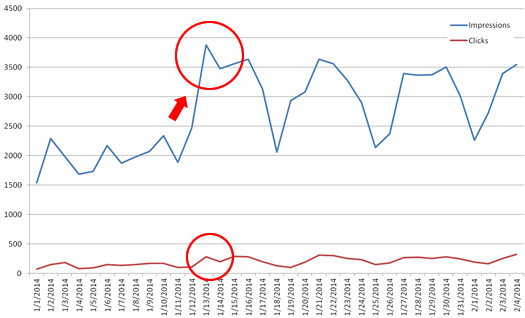 For example, here’s the trending for a site that directly competes with a Panda victim I analyzed. Notice the jump starting around January 11, 2014. A Note About Expedia – Was it Panda Versus a Manual Action? It sure looks that way to me. Nobody knows for sure other than Google and Expedia, but the drop occurred exactly when I saw the January Panda update. Check out the trending below based on Search Metrics data. That’s just something to think about since many people believe that Expedia was hit by an unnatural links penalty. I tend to think it was Panda instead. That said, I would have to heavily analyze the keywords that were impacted, the content that was once ranking, etc. to better determine if that was the case. As I explained above, it’s getting extremely difficult to identify Panda updates. They are supposed to roll out monthly, take ten days to fully roll out, but Google won’t confirm when the updates occur. For the average business owner, this is a recipe for serious confusion when organic search trending takes a dive. My goal with posts like this one is to provide as much data as I can with regard to major algorithm updates so webmasters can take the appropriate actions to rectify the problems at hand. Without understanding the specific algorithm update that hits a website, companies could struggle with deciphering the root cause of the problem. And that could easily lead to spinning wheels, or in a worst case scenario, implementing changes that actually make the situation worse SEO-wise. Moving forward, I’ll try and document subsequent Panda updates the best I can.